"OLE MOTHER," a.k.a. 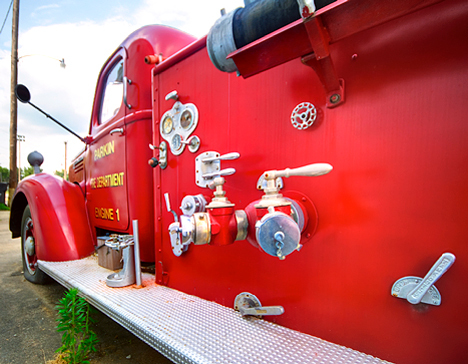 Unit 1 of the Parkin, Arkansas Fire Department, a 1947 International Harvester KB6 Fire Truck.The truck is in operable condition despite its age. 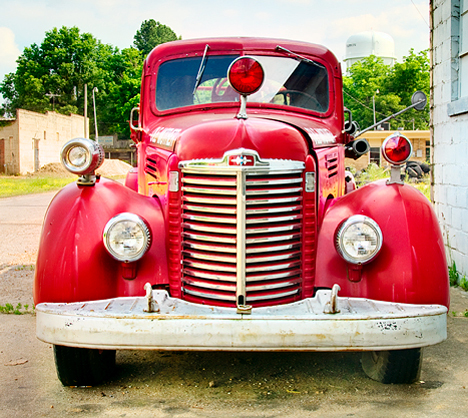 While I was watching this fine old fire truck in Parkin, Arkansas, I was being watched. My being watched, however was benign and not on account of suspected nefarious activities. I was peering in the passenger side window of the truck when a member of the fire department pulled up behind me. We had a short conversation and he opened the unlocked door to improve my inspection of the unit. Before this tale goes much further, you can see two more pictures of the truck and get in on the start of the story on the Photo of the Week page at Corndancer dot com, a very cool thing to do. Click here, to go there. OLE MOTHER, although now relegated to parade duty and outside storage in favor of its more modern successors, is operational, at least to the parade extent, although the fireman, Theo Melton told me the last time they cranked it up, the pump was in good working order. When he pulled beside me I asked if this was his home territory. He allowed as how it was. I told him what I do, as in shooting and writing about what I shoot. He was quick to tell me that on this road (one way in and one way out) strange vehicles were viewed with no small amount of suspicion. I had driven past his home on the way in. It appeared the conversation was headed south but eventually we mutually assured each other that everything was OK. As a result, he told me what I had shot was an old airplane hangar from the days when his father-in-law owned and operated an “Aeronca Champ” from the now grown over grass strip next to the old hangar. Then invited me to shoot the old building. We parted friends. The old hangar has been out of use for ten years or so. It appears older due to some tornado damage it endured several years ago. The private landing strip was used by the community. After I left Parkin, I went to Marked Tree, Arkansas and took a good looksee for stuff to shoot. After meandering around town for a while and finding nothing that blew my dress up, I was leaving when I noticed a local police car behind me. I thought to myself, it’s a guy doing his job, or a coincidence. I was on the road again, headed to Tyronza, Arkansas. In Tyronza, after some brief reconnoitering, I found an old Lion Oil “fillin,” station which been converted to the “Southern Tenant Farmers Museum.” It begged to be shot. The Southern Tenant Farmers Museum in Tyronza, from the exterior is a pristine restoration of an old thirties era service station. Lion Oil Co. was an Arkansas oil producer and refiner. After finishing the shoot, I packed up and as I was leaving town, a local police car pulled in behind me and followed me out of town. Not having a guilty conscience (any more), I felt no threat or trepidation to this latest incidence of law enforcement attention, but I did rule coincidence out. All is well as long as you don’s see the blue lights and hear the dreaded words, ” … you in a heapa trubbel boy … .” I experienced neither of these less than desirable conditions and felt some comfort that if they would follow a harmless photographer around, they would follow anyone around. "Mine is bigger than yours," they seem to say. 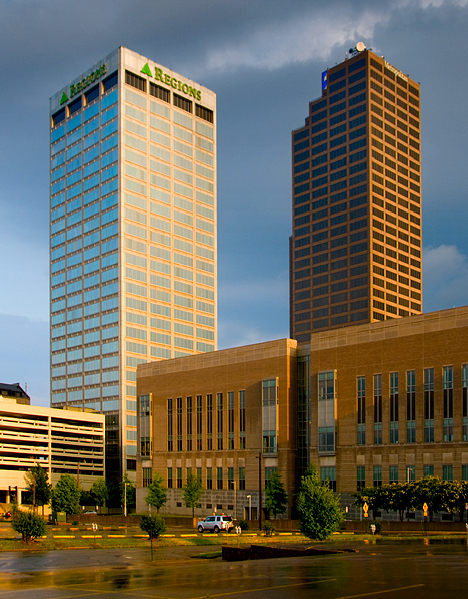 Neither of Little Rock's largest buildings are occupied by their original builders. Life goes on. Nice light just after a storm cleared. After shooting the old hangar the day before, I wound up in downtown Little Rock during a thunderstorm. Rained cats and dogs for about five to ten minutes. The rain left as fast as it came in and in cloud-free aftermath, the late afternoon sun blasted through and cast some great illumination on Little Rocks two tallest structures. Nice light. I finally decided that being watched is not a bad thing. I met a couple of new people who were very nice. And like it or not, had a couple of police escorts. What could be safer? Each week we post all pictures from our current shoot(s) in a gallery of larger, cleaner, high resolution images. We include in this gallery the pictures we did not post on either of our sites. The pictures are in black and white AND color. Click here to see these images. You will see another downtown shot and a country shot not posted anywhere else. You will be glad you looked. A thunderhead is forming in the distance from this winter wheat field on Arkansas Highway 42, not far from Twist, Arkansas, north of Earle. Fortunately a storm did not materialize. The sign said Twist with an arrow pointing to the right, a temptation too rich with mystery to avoid. On the way to Twist, the cloud formation was similarly too good to resist. Late afternoon sunlight is the best, particularly this time of year when mother earth is freshly greened. This was just the first stop on the Twist adventure. The last stop was to shoot a statuesque grave marker, an blond angel no-less, standing alone in a bean field. Before we go too much further, take a look at the bean-field angel on the photo of the week page at Corndancer dot com. Click here to go there, a cool thing to do and a trip you will enjoy. It’s not often that one encounters a blond bean field angel. 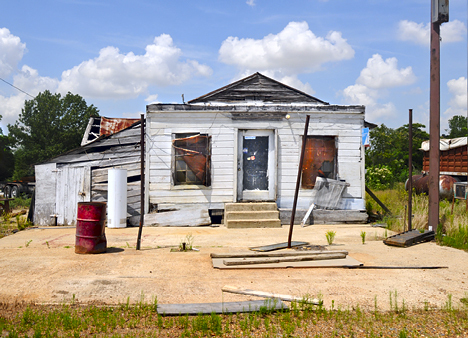 But, regarding trips through the Arkansas hinterlands, one can always fall back on an observation by the immortal Fats Waller, to wit: ” … one nevah know do one?” Note: May 31, 2010: I came up with some additional information on the angel which may be of interest. The additional information is now posted on the Photo of the Week page, link above. 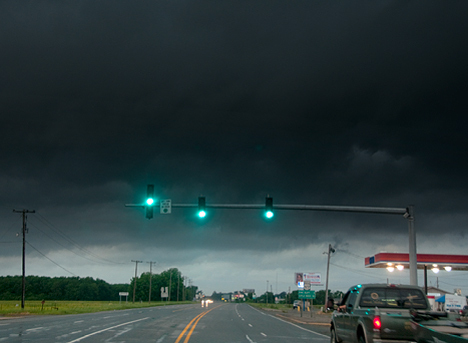 Once we shot the cloud formation, it was off again to Twist, Arkansas. 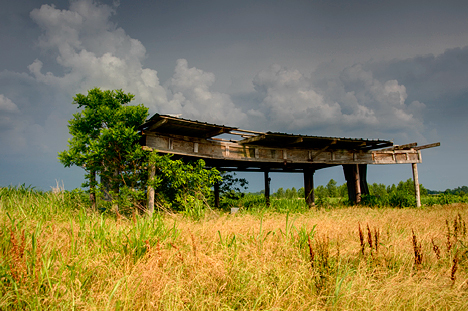 Twist is what’s left of theTwist Plantation, an agricultural venture of the past. Twist was a typical company town. The company owned everything. It was well organized with courts, a jail, a water system and a company store. Dan Douglas, a resident of Twist and an employee of the current operators was congenial and filled me in with Twist information. As I was shooting, I could hear birds singing a whippoorwill-like chant in the background. Turns out, according to Dan, I was listening to the industrial strength cooing of Ring-Necked Doves, a species he says is unique to the immediate area. 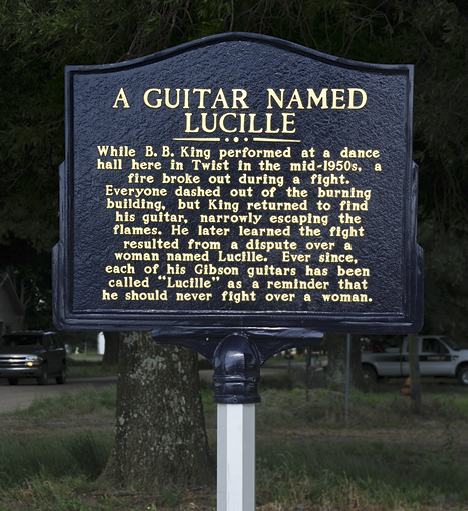 Virtually any blues fan knows blues legend BB King has always named his current Gibson guitar Lucille. I have often wondered why. Although I have not lost any sleep over it, I was glad to know the answer. I found it in Twist. Thanks to the good folks of Twist, now we know. Mind you, this odyssey of the unusual is happening in the waning hours of the trip. I had begun to think there would not be much out of the ordinary that would go home on my camera cards. Wrong again. Moving right along after we left Twist on Highway 42, the next surprise was the barn being eaten by ivy. There’s got to be a building in there somewhere. Earlier in the day, heading north on US 79 from home-base in Pine Bluff, Arkansas, we stopped in Wabbaseka and long overdue, shot the Wabbaseka United Methodist Church. The building is listed on the National Register of Historic Places. 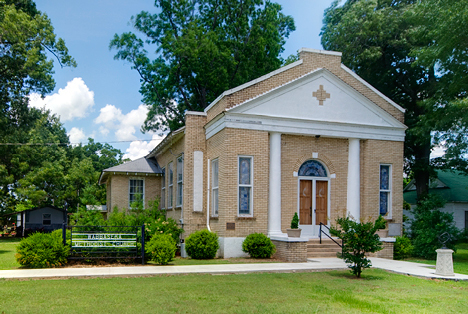 While just about everything else in Wabbaseka has suffered a fate all to common in small rural agricultural communities in the nation, the Wabbaseka United Methodist Church is a pristine premises. Call it Divine Intervention if you will, but I’m betting sweat equity is more apt. Further north past Clarendon on the way to Forrest City, we found a substantial flag waving at what appeared to be a farm headquarters. I decided if it was worth flying, it was worth shooting. Camera perspective is fooling your eyes. 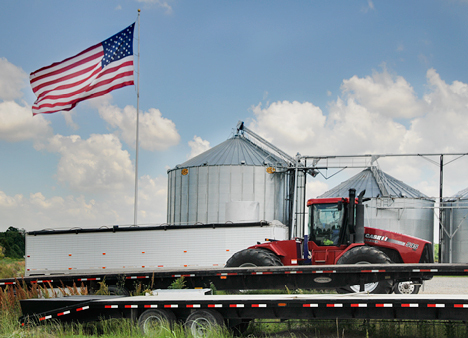 That flag is about half as long as the truck trailer. Each week, we post all of the “keepers” of the shoot or shoots for Corndancer and Grist posts in an on-line picture-only gallery. There is normally not room to publish all we shoot and like. The pictures are high resolution and larger that the posts. Each week, we post all of the “keepers” of the shoot or shoots for Corndancer and Grist posts in an on-line picture-only gallery. There is normally not room to publish all we shoot and like. The pictures are high resolution and larger that the posts. This week includes a railroad bridge and another view of the ivy barn. Click here to go there. Thanks for visiting our meandering. It’s a nasty job, but someone’s got to do it. 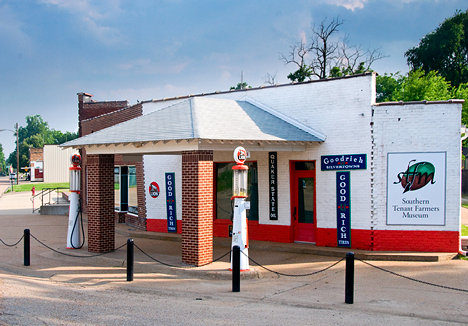 Fendley Store was opened by Kirksey family members in 1907 and closed in the forties. The Kirkseys have kept it in serviceable condition since its closing. Seemed like the right thing to do. When you pull into Fendley, Arkansas it’s hard to miss Fendley Store. There’s not much else from an urban development viewpoint and that’s not a drawback if you happen to be a Kirksey. As a matter of fact, it’s close to ideal. The family has lived on this real estate since around 1874. Across the road from the store in one direction is the home of one of the original Kirkseys, still in use by a Kirksey. To see the house (complete with tire swing and a neat little stone bench), click here and go to the Photo of the Week Page at Corndancer dot com where this story started, a very cool thing to do. Also see one of the Spring Creek Nursery greenhouses and three generations of Kirkseys. Take your time, we’ll wait here while you look around a bit. Across the road in another direction is Spring Creek Nursery operated by Brian Kirksey and his family. The nursery is just part of what the Kirkseys do. They also raise cattle, build greenhouses and are in the timber business as well. 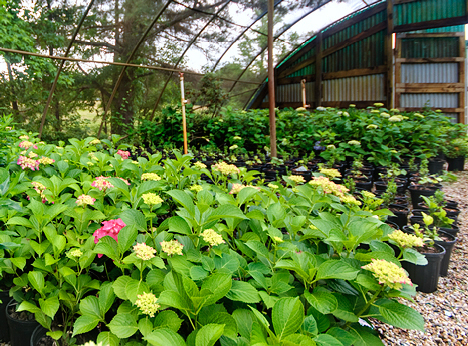 Spring Creek Nursery greenhouses are designed and built by the proprietor, Brian Kirksey. They are good stewards of the environment. Diligent recycling is a part of their business. The Spring Creek Nursery is a sophisticated operation in a rural setting. Low traffic. Low noise. Low hassle and a zero mileage commute. The family has five dogs, four of which are normally part and parcel of the daily “work-flow.” What is commonplace at Fendley is spectacular to those of us who see far too much asphalt and traffic. Take Moorman Road for example. 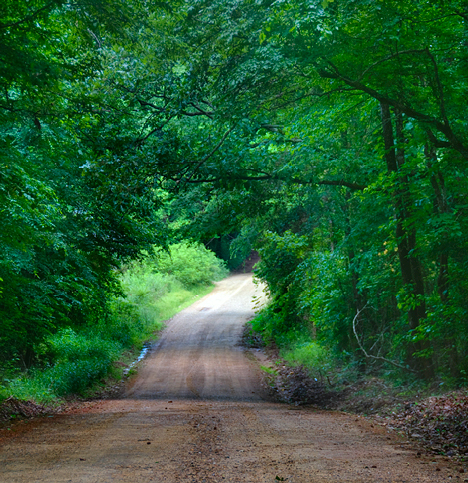 The road runs through the Kirksey Farm. 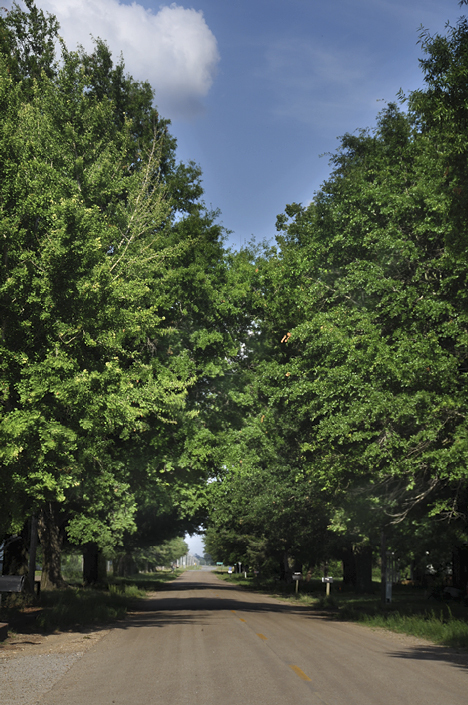 Not far from one of the greenhouses, the summer foliage of trees lining the road form a verdant tunnel. Not too shabby for less than a block and a half from Main Street. Moorman Road running through Spring Creek Nursery forms this living tunnel. 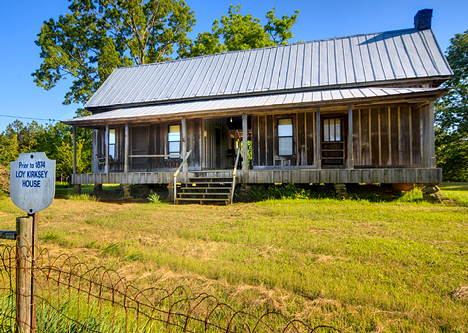 Just a few miles west of Fendley, on Still Creek Road, you will see the perfectly restored Loy Kirksey “dog-trot” house restored by relatives of Brian Kirksey. The house is listed on the National Register of Historic Places and is a perfect example of this popular style of 19th and early 20th century rural architecture. 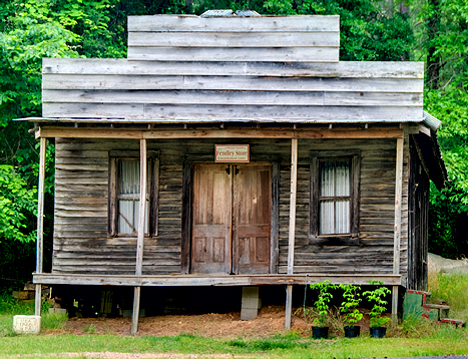 Sometimes you hear of these houses being referred to as “shotgun”house, which is a misnomer. The Loy Kirksey House, originally built prior to 1874 is on Still Creek Road northwest of Fendley. Dog trot houses got their name from the style of two living spaces separated by a breezeway, through which one's dog could and would trot. Each week, we post all of the “keepers” of the shoot or shoots for Corndancer and Grist posts in an on-line picture-only gallery. There is normally not room to publish all we shoot and like. The pictures are high-resolution and larger that the posts. This week the additional shots include some more green house, dog-trot, tunnel and tire swing shots in color and good ol’ black and white. Click here and take a good look. Thanks for dropping by and taking a look at how things are in a completely rural setting. I’m giving it a dozen thumbs up. The old house is a survivor. Easily built in the late 19th or early 20th century, she is tenaciously hanging on to the last gasp. Recently, for reasons unbeknown to us, she was spared the terrible blade of the bulldozer which cleared the land on which she sits. Someone wanted her left standing. Since they aren’t building many dog-trot houses these days, leaving her be is a good thing. You can see more pictures of this old home on the Photo of the Week page at Corndancer dot com where the story started. Click here to go there, a very cool thing to do. The home place is strategically placed nearly on the top of a hill, otherwise known as the “military crest” on Borderwieck Road near Amity, Arkansas. Just a few yards from the house is a log barn, probably built years before the house. Quite a bit of the log walls of the barn are intact, but weakening on a daily basis. Like the house, the barn was constructed on the dog trot principle − two living, storage, or livestock sections separated by a breezeway. 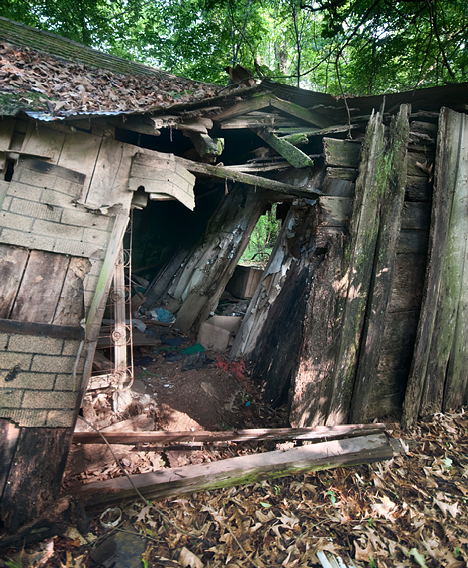 In some of the more primitive cases, the original home was a barn and family living quarters. It appears that the final use for this structure was to store used buckets. There are hundreds of buckets of all stripes stashed in the structure. 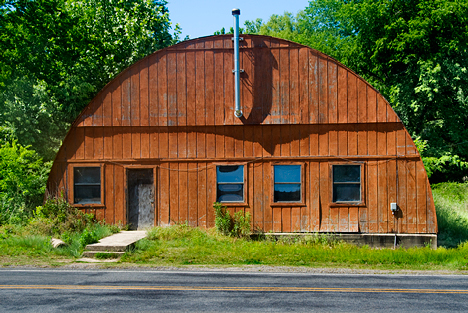 Earlier in the day, while tooling through Bismark, Arkansas, I came across the Quonset hut type building. It seems to be in use, what for I cannot tell. Quonset huts, similar to this one were manufactured by the thousands in World Ware II. The requirement was for a simple, strong building which could be cheaply built and required few special skills to erect. The quonset hut met all of those requirements with flying colors. 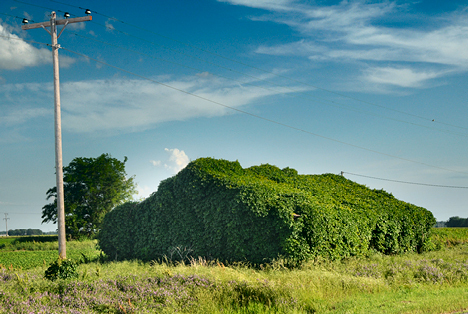 Speaking of unusual buildings, this one stands for all the world to see on the southwest side of Fordyce, Arkansas. Originally it was to be a place for quick oil changes and the like. That did not work out and several other businesses gave it a whirl in the building. The last one was a trucking service headquarters. None of the subsequent tenants after the oil venture saw fit to change the colorful exterior decor. 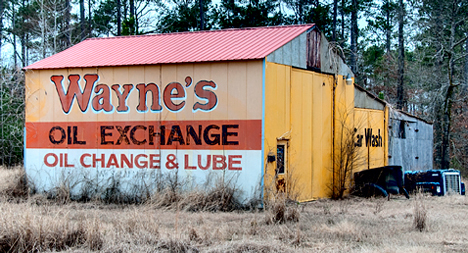 What used to be Wayne's Oil Exchange. The sign was great. Business wasn't. Virtually every practitioner of the visual and communication arts would find favor doing what they do best in Hollywood. At least for a while. This past weekend, my fondest hopes were realized in Hollywood. Arkansas. No zip code. But a nice place. 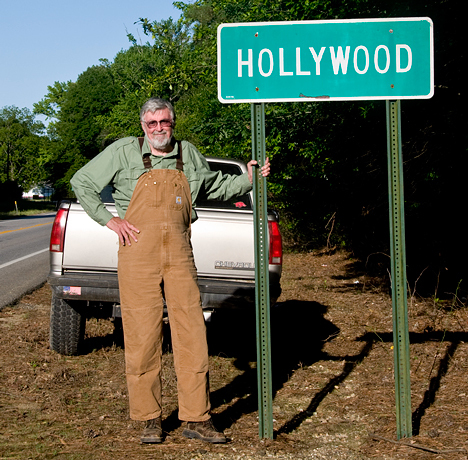 If you have to visit Hollywood, this one may be preferable. Me. Not surprisingly, this is the worst house in the neighborhood. The neighborhood consists of two houses. The other one is in somewhat better condition than this one, but not much. Someone at some time picked up and left, and never came back. We wonder why, but probably not loose any sleep over it. 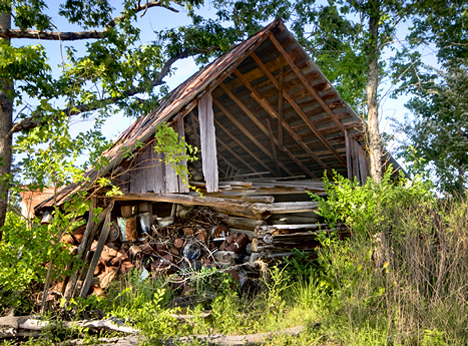 The old house and its neighbor can be found on County Road 49 in Lincoln County, Arkansas, not far from Yorktown. A lot of folks gladly tell you they are from Yorktown, which consists of a barbeque cafe, a gin and a bridge over Bayou Bartholomew. At 375 miles in serpentine length, Bayou Bartholomew is the longest bayou on the planet. I have never figured out exactly where Yorktown stops and starts, but it looms large as a community. 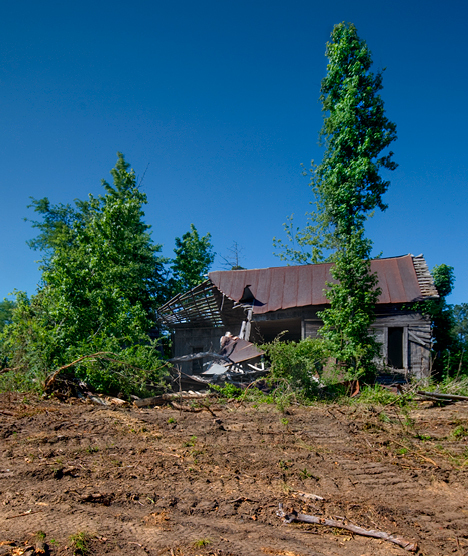 The site is marked by a large “home-place tree,” which is destined to far outlast the crumbling homes. See the other house and the tree on the Photo of the Week page at Corndancer dot com, a very cool thing to do. Click here to go there. We’ll be right here waiting when you get back. Alas front porch, I knew ye well. Get a good look. The house is nearly history. 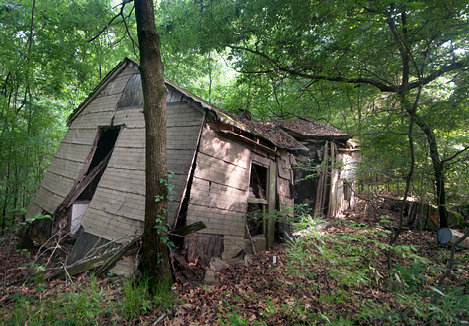 The retreat from this tar-paper sided house may have been hasty. At the bottom of the back opening is a cardboard box full of washed and capped jars, some of which are mason jars. Anyone who went to that trouble would probably have taken the box along as the departure unfolded. Perhaps they were one step in front of someone who did not have their best interests at heart. In that case, leaving the jars and the box springs may have been OK. The good news is, it’s late April and early May in Arkansas. The bad news is, it’s late April and early May in Arkansas. Opposing forces of nature give rise to these observations. After a winter that finally departed, kicking, clawing and objecting as it bade farewell, a magnificent spring made its grand entry. Replete with blooms, bees, buds, and temperate days. the season, despite a more intense than normal pollen assault wasn’t all that shabby. There was enough rain to make nice waterfalls and most of it eschewed the weekend to make its arrival. As of about ten days ago, that honeymoon with spring was over. It’s thunderstorm and tornado time in the neighborhood. As I pursued this Saturday afternoon trip, the weather worsened, mainly north of where I was at the time. 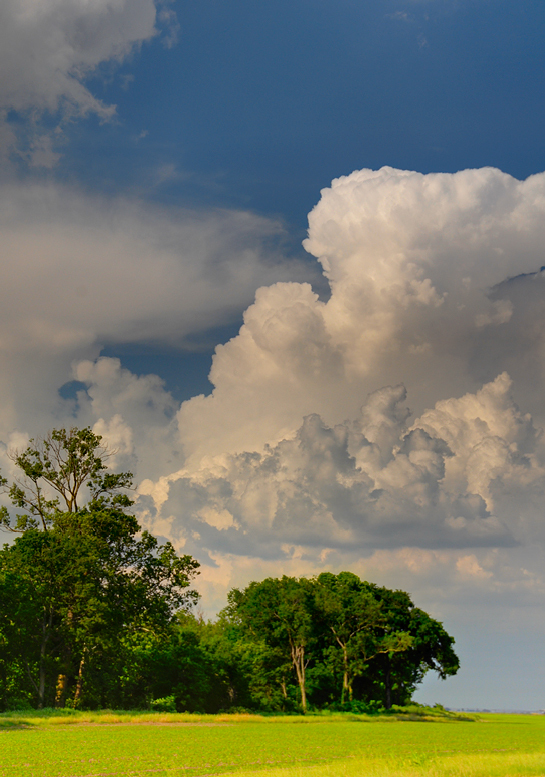 As a result, the cloud formations were dramatic, not a bad thing for a photographer. 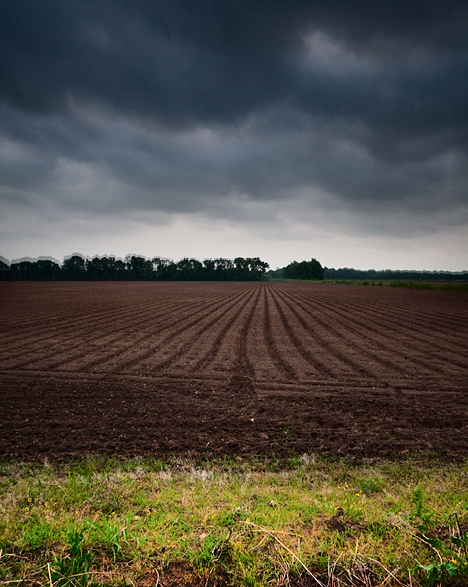 The storm is gathering over this field just west of Grady, Arkansas. As I traipsed along, I turned on the radio for a tune or two, and lo and behold, the music was replaced by a TV meteorologist informing this part of the world that southwest Pine Bluff, Arkansas was precariously close to being struck by a tornado. Since that’s where I live, I pointed the truck north and depressed the accelerator. And kept my ears glued to the radio. You are looking in the general direction of my residence a few miles from here. This is the junction of US Highways 65 and 425, southeast of Pine Bluff, Arkansas. As I reached the outskirts of town, the news improved. The core of the storm had moved east and according to my spousal unit, the house was still standing and all occupants, one woman and a herd of animals, were alive, well and taking on nourishment. That being so, and the talking heads were broadcasting a blow by blow account of the storms progress, I decided to chase it. 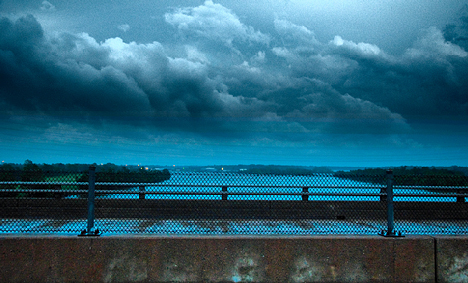 The US Highway 79 bridge over the Arkansas River, north of Pine Bluff, Arkansas. Turns out, the chase was futile and I terminated the pursuit on the outskirts of Altheimer, Arkansas and headed home on US Highway 79. Taking that route, gave me a consolation prize far better than a storm shot, of which there are probably millions. Since the Lord is continues to take care of fools and drunks, He saw fit to put me on this bridge, with no traffic in sight for miles under the conditions you see above. Not being one to argue with providence, the rest was up to me. The scene was there, and I recorded it. There’s something to be said for a higher power. But wait, there’s more in our Weekly Grist Gallery! Each week, we post high resolution versions of the Corndancer and Weekly Grist pictures. This week in color and black and white. These pictures are larger and at a better resolution. Click here to see these pictures in our Weekly Grist Gallery.